Held at the Safety Training Center behind GVFD Station #2 at 213 Sierra College Drive. Students and their families are invited to attend our 12th Annual Keeping Kids Safe Festival to learn about safety from our First Responders. Meet our local police, fireman, sheriffs, rescue teams, ambulance and helicopter services, plus health agencies and non-profit children’s services. You will see live demonstrations of emergency equipment, and can “visit” fire engines, police cars and an ambulance up close. See a rescue helicopter land and take-off during the festivities. Learn proper home safety practices and school bus evacuation. Families may have their child’s car seat inspected by the CHP at the event. Child Identification Folders will be prepared by the KlaasKids Foundation. A coloring contest, bike rodeo and your Passport to Safety with prizes will add to the excitement. Enjoy free hot dogs, popcorn, snow cones, and drinks. 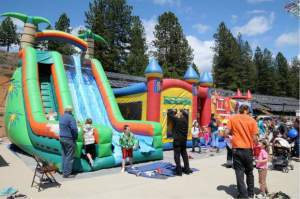 Just for fun, there will be a clown making balloon animals, a juggler, a petting zoo, a bounce house and a giant slide, plus contests, crafts and other activities for children. Gold Country Kiwanis is hosting this 12th Annual Festival with major financial support from The Beam “Easy Living” Center, the Law Enforcement/Fire Protection Council, the Roamin’ Angels Car Club and 3 local Masonic Lodges. Plus, additional support from many local businesses. The event will be assisted by about 50 community volunteers. The Festival will be held on Saturday, May 9 from 10 am to 3 pm at the Safety Training Center behind GVFD Station #2 at 213 Sierra College Drive. Look for the signs. Since it’s Mother’s Day weekend, mothers and grandmothers will be honored.